Synthetic peptide (Human) (within the last 35 amino acids of C terminal end). Our Abpromise guarantee covers the use of ab17204 in the following tested applications. WB Use a concentration of 0.5 - 2 µg/ml. Detects a band of approximately 32 kDa.Can be blocked with Human XAF1 peptide (ab39906). A higher 50kDa band is present at times (lot dependent). This band is not blocked by the immunogen. We do not know the identity of this extra band. Higher 50kDa band presence is lot dependent. This band is not blocked by the immunogen. 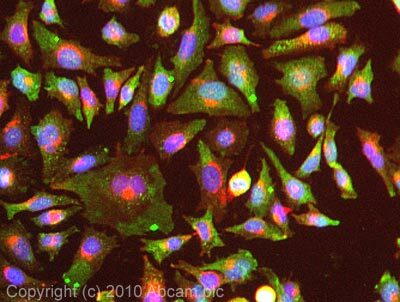 ICC/IF image of ab17204 stained HeLa cells. The cells were 4% formaldehyde fixed (10 min) and then incubated in 1%BSA / 10% normal goat serum / 0.3M glycine in 0.1% PBS-Tween for 1h to permeabilise the cells and block non-specific protein-protein interactions. The cells were then incubated with the antibody (ab17204, 5µg/ml) overnight at +4°C. The secondary antibody (green) was Alexa Fluor® 488 goat anti-rabbit IgG (H+L) used at a 1/1000 dilution for 1h. Alexa Fluor® 594 WGA was used to label plasma membranes (red) at a 1/200 dilution for 1h. DAPI was used to stain the cell nuclei (blue) at a concentration of 1.43µM. Publishing research using ab17204? Please let us know so that we can cite the reference in this datasheet. Thank you for your enquiry. I can confirm the following antigen retrieval methods were used in testing of these antibodies. Please not that this may require individual optimization by customers in their own experiments: ab17204 XAF1 antibody We use a citrate buffer, pH 5.5 and heat for antigen retrieval. ab81353 XAF1 antibody Heat repair: Immerse the paraffin sections into Citrate buffer (AR0024, pH6.0), heat until boiling in the microwave and then cut off the power, keep it in the microwave for nearly 5~10 mins. Repeat 1 or 2 times. Then cool at room temperature and wash 1 or 2 times with PBS (pH7.2-7.6). I hope this will be helpful to you. If you have any further questions, please do not hesitate to contact us. Using ab17204, XFA1 antibody, lot#878581 and we see bands around the 35kDa mark and a band about 50kDa. Thank you. Do you know which isoforms this antibody recognizes? Thank you for your email. Since the antibody was raised against the C-terminal region of the full length protein, the antibody can bind to the following isoforms: isoform 1 (35 kDa) isoform 2 (32 kDa) isoform 6 (22.5 kDa) isoform 7 (34.5 kDa) I hope this information is helpful to you. Please do not hesitate to contact us if you need any more advice or information. I bought XAF1 antibody(ab17204) of your company last month.I have some questions about this antibody. What is the subcellular localization of the endogenous XAF1? Is it right that I dilute XAF1(Concentration is 1.00 mg/ml) with 10 mM PBS (PH=7.4) for using immunohistochemical method. Thank you for your enquiry. According to the following publication XIAP is localised to the nucleus in HeLa cells transfected with an RFP tagged version of the protein. Identification of XAF1 as an antagonist of XIAP anti-Caspase activity. 2001 Liston P, Fong WG, Kelly NL, Toji S, Miyazaki T, Conte D, Tamai K, Craig CG, McBurney MW, Korneluk RG. Nat Cell Biol. Feb;3(2):128-33. For the application by immunohistochemistry we do not yet have a recommended dilution. This should be determined by the end user. For a detailed protocol I would recommend that you consult the following protocol: https://www.abcam.com/index.html?pageconfig=resource&rid=10381 I hope this information helps, please do not hesitate to contact us if you need any more advice or information.